The Hough Ear Institute has a passion to educate others in audiology and surgical techniques so that as many patients as possible can receive the benefits of the technology that is already available for curing deafness. This endeavor is met through three initiatives: otology workshops, international education, and fellowship programs. Temporal Bone Surgical Dissection Courses are held at the Hough Ear Institute. Otolaryngologists and residents from across the country attend courses on temporal bone dissection, providing them with advanced training in otologic treatment options and surgery. The course provides instruction pertaining to the latest techniques for treating chronic ear disease and are exposed to a variety of surgical and treatment procedures, including the performance of tympanoplasty, ossicular chain reconstruction, mastoidectomy, stapedectomy, treatment of vertigo and management of the facial nerve in chronic ear surgery. In addition participants experience an actual surgery using video-conferencing and students experience “hands on” surgery techniques as they work in the HEI dissection laboratory. A unique aspect of this workshop is telemedicine training accomplished by observing a live otologic surgery done in the operating room at INTEGRIS Baptist Medical Center. For many years surgeons, audiologists and scientists at HEI have freely given their time and energy to teach others their skills and technology. From the beginning, HEI personnel recognized that sharing knowledge within the profession is of utmost importance. Thousands of physicians and allied clinicians have been trained by HEI personnel in short courses or seminars, either at HEI or in their own states or countries. 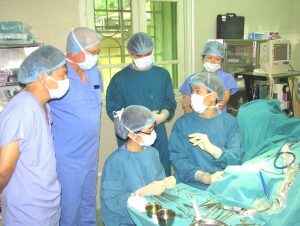 Teams from HEI have made overseas trips to such countries as Vietnam, Zimbabwe, Kenya, Zaire, Moldova, Siberia, Ukraine and Jordan, performing ear surgery and/or teaching doctors. In 1995, Dr. Jack Hough went to Vietnam to determine if the ENT sector in Vietnam was interested in a cooperative effort with REI-Vietnam to educate, instruct and train Vietnamese ENT physicians in state-of-the-art techniques and improve the quality of medical services for the Vietnamese people. The National ENT Institute in Hanoi and the University of Medicine and Pharmacy in Ho Chi Minh Ctiy accepted Dr. Hough’s offer to initiate and develop an ENT program for their institutions. The first ENT exchange was in 1996 with Dr. Hough as team leader. Dr. Hough, along with seven other otorhinolaryngologists, conducted seminars at the National ENT Institute in Hanoi and the University of Medicine and Pharmacy in Ho Chi Minh City. During this same year, the first of many Vietnamese ENT physicians visited this country to study and observe. 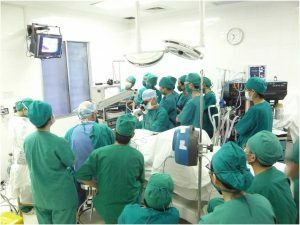 Along with conducting seminars and training sessions, the ENT teams from HEI have hand carried state-of-the-art equipment that was donated to the ENT instutions in Hanoi, Ho Chi Minh City, and Hue. A major program at HEI is a formal research and education fellowship in otology and neurotology that is ongoing for graduate-certified otolaryngologists who wish to restrict their specialty practice to ear surgery. As a result, those trained at HEI are now practicing otology and teaching others all over the world. A large part of what Hough Ear Institute does is the training and mentoring of international doctors. Doctors come to HEI from developing countries for training fellowships. This Fellowship has been an exceptional experience for me in my career and in my life. I am so excited and wanted to stop and tell you how much I appreciate your help over the 9 weeks. You were patient, inspirational, and actually made things fun. I have learned so much, seen lots of new things, made lifelong friends, and had a ton of fun. It not only enhances my knowledge and technical skills in ear surgery, especially in cochlear implants, but also enables me to know about your beautiful country, your culture with hospitable people. Also please send my deep gratitude to your families, you truly made me feel at home and part of your families. Thank you, Dr. Kopke and the rest of the HEI team, for such a fantastic Fellowship. The impact of your help is so significant. It will help me for the rest o f my life. Thank you so much for everything. I will not forget it. To finish this project, we need your help. Please consider a donation today which can be made by check or through our secure online form. To ensure your donation is directed properly, please add “International Education” in the comment box below. With your help, we’re closer to breakthroughs that could help restore hearing loss. Read more.